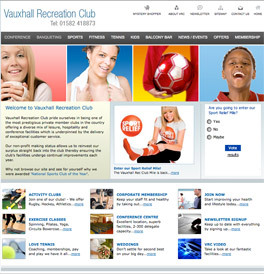 Vauxhall Recreation Club (VRC) consulted with MidniteHour to re-structure their current website content and navigation to implement a user friendly informative website that allows the user to search the diverse mix of leisure, hospitality, news and conference facilities with ease. The overall look and feel of the site design is clean and fresh, focussing on the facilities and services offered by VRC. The design was implemented with easy to use navigation throughout and interactive response forms for the user to easily contact the club. The main site acts as a portal for all of the services available with various videos available to view of the different facilities and activities on offer. We then designed 2 micro sites for the Conference area and the Banqueting area, existing on their own URL. On the Conference micro site we configured a streaming video to show the size and flexible usability of the room. On all three sites the user is able to download fully printable brochures and menus to enable them to organise their specific event. The Content Management System was built with the ability to update the ever changing news, events, menus and special offers that take place at VRC which keeps the site looking fresh and interesting for the new and existing visitors. MidniteHour created the E-zine template for email distribution to existing and new members who have signed up for the monthly newsletter . The user is able to sign up to the E-zine from the website and is able to indicate a specific area of interest to them. VRC are then able to target announcements and special offers to the club members interested in that specific area. This works well with the seasonal activities and also the children’s holiday activities. VRC are able to direct existing and potential new clients to the user friendly website to help with information regarding what facilities and services are available. The website is constantly being updated by VRC through using the Content Management System, enabling them to inform the user of all the current special offers, menus and class timetables. The Ezine communicates to the club members, news, classes, sporting events and upcoming social events at the Balcony Bar along with new menus and entertainment.